We woke early and did the final 20 or 30km to Dravograd by morning tea. We followed the main road along the river for the most part, but towards the end a sign sent bikes on a detour along some quieter roads. There were a couple of climbs along this route but they were short and no problem. The route along the river Drava between Maribor and Dravograd is quite beautiful and doesn’t have too much traffic. In Dravograd we found a cafe that did terrific cakes, then continued along the river Meža (more of a creek) through Ravne na Koroskem, Prevalje, Mežica, and Črna. In Črna we had some pizza (the cheapest eating out of the trip at €3.50), then asked the locals about the road we had chosen to Solčava, and they said if we were in good condition we could make it. We thought they were implying it was reasonably easy, but it turned out to be the hardest part of the entire trip. For the first few kilometres we followed a creek up a gentle climb, then we hit a very steep dirt road and a lot of rain. It was wet, cold, and very hard going up the slippery gravel. We even pushed the bikes for about half a kilometre. It took about 2 hours to go about 13km to the top of the pass. I think the climb was from around 500m to around 1400m. It was very beautiful, but, exhausted and cold in the rain, we didn’t have an opportunity to appreciate it (or take any photos). This was followed by a very steep downhill, which was just as hard because our exertion had been keeping us warm and now we froze. We finally made it Podolševa and hid from the rain under the eaves of a farmhouse. When the rain settled we were given directions to a guest house, Majdač, a few kilometres away in Solčava. The woman there was incredibly helpful and for €40 we were given a bed, fed a wonderful dinner and breakfast, and all our clothes and shoes were dried. There was also a terrific view of the Kamnic alps which we had just crossed. 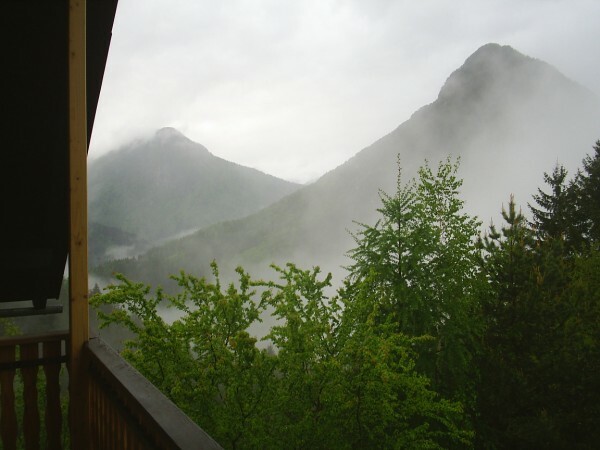 This entry was posted in Slovenia and Croatia and tagged Drava, Kamnic Alps, Podolševa, Slovenia, Solčava by wally. Bookmark the permalink.